WHY DO I STUDY A DIPLOMA IN CHRISTIAN MINISTRY? 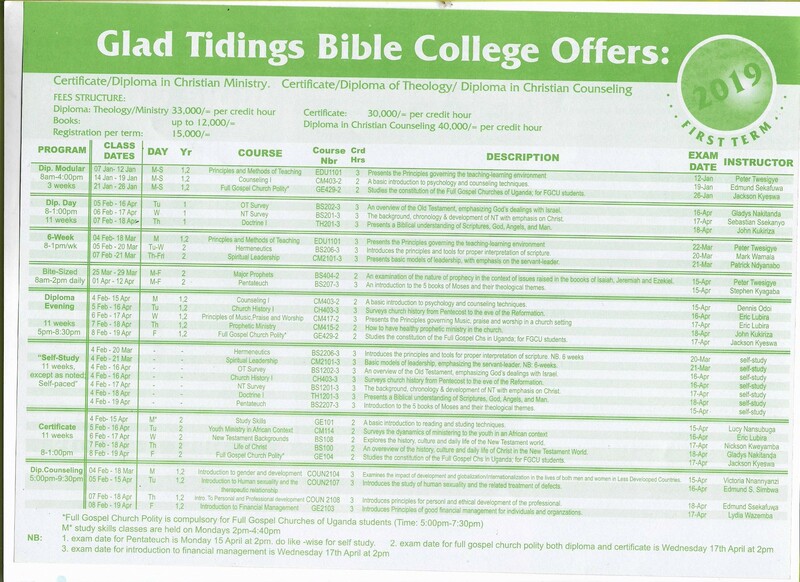 The Diploma in Christian Ministry is primarily set up for part-time students. It has a requirement of 64 credit hours which means it can be completed in 2 years on a part-time basis. WHO QUALIFIES TO DO A DIPLOMA IN CHRISTIAN MINISTRY? The diploma in Christian Ministry programme at GTBC is open to all mature born-again Christian candidates who have a call to serve God. Applicants must have completed senior six, Uganda Advanced Certificate of Education (U.A.C.E) or its equivalent from a recognized institution. Applicants with a certificate in Christian Ministry from GTBC, or its equivalent from any other recognized institutions, or our Extension Schools, may be considered for this programme. There are numerous ways a person can study for this Diploma. Students pay as they go according to the courses they decide to take. There is NO residential program for the Diploma in ministry.